The Morven Summer Institute announces that it will offer up to five partial scholarships for the summer of 2015. The Morven Summer Institute (MSI) serves to bring University students out to Morven Farm and into a “living laboratory”—a physical space where they can address questions of sustainability, ecology and ethics by conducting their own research, interacting with their environment and making both local and global connections. Morven Farm is a 3,000-acre farm owned by UVa located 20 minutes from Grounds. Through MSI, the farm becomes an extension of the Academical Village, promoting interdisciplinary collaboration and enriching students’ education through experiential learning. This year the program is offering four courses: Farmers Markets, Food Politics and Research Methods; Agro-Ecology; Sustainability and Human Needs; and Religion, Ethics and Global Environment. Students will take field trips, conduct experiments, and participate in activities that reinforce the concepts they discuss in their classes. Please see the MSI webpage: http://www.virginia.edu/summer/morven.html. Application and selection process: 1. 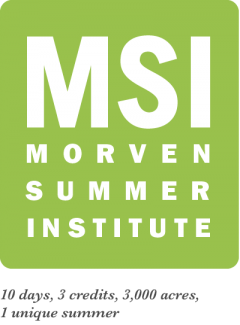 Short essay (300-500 words): Why are you interested in taking a course at the Morven Summer Institute? How does MSI fit into your past and future coursework, past experience in food/agriculture/sustainability, and your post-graduation plans? 2. Please submit your essay, copies of your resume and transcript (from SIS), and two references by April 13 to Whitney Farmer, Morven Farm Programs Assistant, waf7r@eservices.virginia.edu. 3. Selection criteria: The MSI committee will select scholarship recipients on the basis of the essay, financial need, resume, transcript, and references and will notify recipients on April 22, 2015 by email. One last note: for the references, we only need names and whatever contact information you can easily provide. No letters required!